You might look a bit goofy walking around in a giant bubble, but when torrental rains start pouring down from all directions, a tiny collapsable umbrella won't do much for you. This full-body umbrella on the other hand will keep you dry and warm no matter how bad it's coming down...at least, as long as you're wearing some nice thick boots to keep your feet dry. 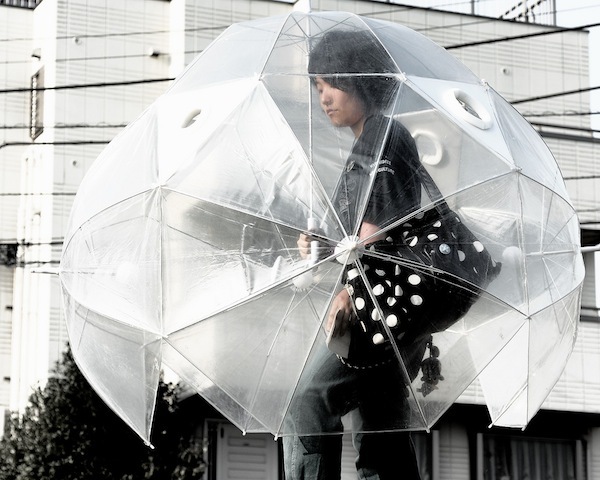 Plus, this great bubble-brella will keep you from ever accidentally touching or interacting with someone when you want to be alone. This great umbrella was spotted in use somewhere in Tokoyo by Flickr user Kiks Balayon, but there's no word yet on whether or not it was handmade or if it's available for sale. There's also no word on how the heck it actually closes back up as you presumably wouldn't want to carry this around and store it in your house at this size.